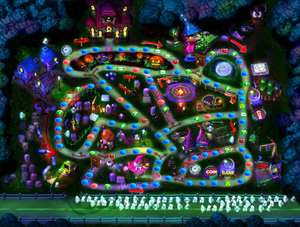 Horror Land is a haunted forest in Mario Land in Mario Party 2. Players are dressed as wizards and have "Wizard" in their names. The gimmick of this board is that it alternates between night and day every two turns. There are more Boos here than on any other board, including the difficult-to-reach Big Boo (who steals coins and stars from all the other players for three times the normal price of the average Boo). The time of day determines which Boos are available. Whomps guard three separate junctions, and players who wish to take the path Whomp is blocking have to pay him 5 coins. Players that take the path Whomp is not guarding makes him move to that pathway (these Whomps are similar to the ones from DK's Jungle Adventure). At nighttime, the Whomps are under a spell that makes them unable to move. The day-and-night system would become the foundation on which Mario Party 6 was built. When players come to Mr. I's warp spot, he appears to them asking if they want to see his magic. If they accept, Mr. I takes them, and any other players in the way, to the warp spot on the other side of the board. The fee for this is 10 coins during the day and 5 at night. There are other ways of changing the time of day rather than just waiting 2 turns for day to turn to night and vice versa. Landing on a Happening Space also changes the time too. At nighttime, players that come by a dancing floor are asked by a few Boos and Mr. I's if they want to dance with them for 20 coins. Accepting this makes night become day. During the daytime, players that come by the "Mystery Mansion" at the top of the board are answered at the door by Kamek the Magikoopa. He asks players if they want him to light the "Darkness Lamp" for 10 coins. If accepted, he'll light it, and day becomes night. If the player passes the mansion at night, they will hear loud and festive noises, implying a party. 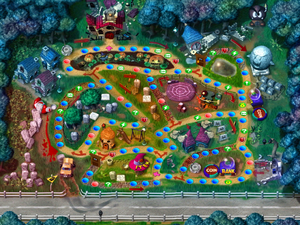 The Item Minigame is Coffin Congestion, and the Duel minigame is Mushroom Brew. At the end of the game, a red Koopa Troopa comes and alerts the players that the villain of the board, Wizard Bowser, is out causing havoc in the forest. A cutscene then shows a green Koopa wandering the woods at night. He gets surprised by a Boo, who quickly leaves. A cloaked figure then comes to help, but it turns out to be Wizard Bowser. He turns the Koopa into a frog, but at that moment, the winner of the game comes to the rescue. He or she turns the Koopa back to normal (using the Magic of Truth) and then engages in a power struggle against Bowser. Bowser loses, getting turned into a frog himself, and hops away. This leaves the winner to be congratulated by the other players, Toad, Koopa, and the Star. Mad Piano makes a cameo in this course, but only at night. If the player looks closely at Mr. I's path, they can see that there is a pumpkin that was rolled over, presumably by Mr. I himself. This page was last edited on October 21, 2018, at 02:32.